I tried to push the envelope a little bit with a bold and unusual color combination, paired with a funky mix of modern, retro, and true antiques. It’s definitely a space I, personally, would be happy to live in–a curated mix of all the things I love. Well, It’s been a little while since the 2014 Bucks County Designer House closed its doors to the public (at the end of May). 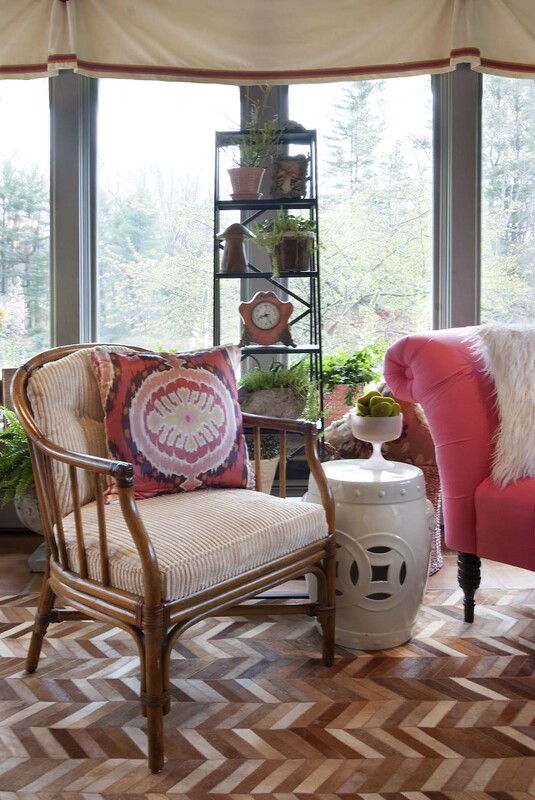 So I think it’s finally time I shared the images of how my Sunroom with Vintage Vavoom turned out. Thanks for following along with me from my very first post, back in February of 2014. You can read that post here: http://wp.me/pEVbo-4e and follow along with my design process in subsequent posts. You may remember that my space looked like this before I started work. 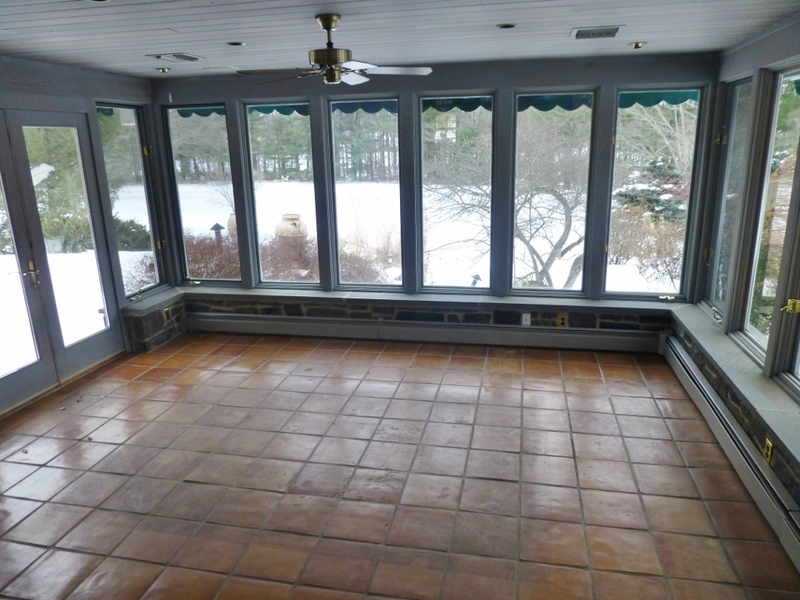 I chose to keep (and clean up) the existing grey-stained woodwork and the terra-cotta tile floors. 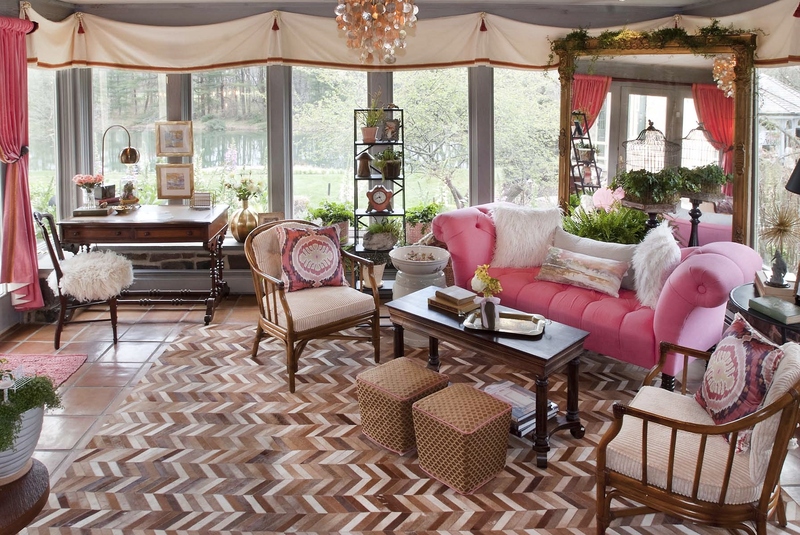 Bold coral accents are found throughout this eclectic sunroom, along with a statement rug made of cowhide in a chevron pattern. Three centuries of antiques are represented in the space. A linen-covered screen anchors this back corner (and covers up bulky existing wires, left by the homeowners). The oldest item in the room is this 18th century Duchesse Brisee, paired with a modern metal base end table. A 1960s vintage chandelier provides light for relaxed reading while lounging and taking in views of the pond outside the windows. A handsome 19th century desk and chair are placed in the windows to allow for working while enjoying the view. You can also see a close-up of the custom valances in this image. The simple ivory linen-textured fabric is enhanced by a layered gold velvet and coral braid trim. Starburst medallions and coral tassels are found at the junction of each soft swag. Here’s a detail view of the desk, and the adorable Victorian chair with its flokati wool covered seat. 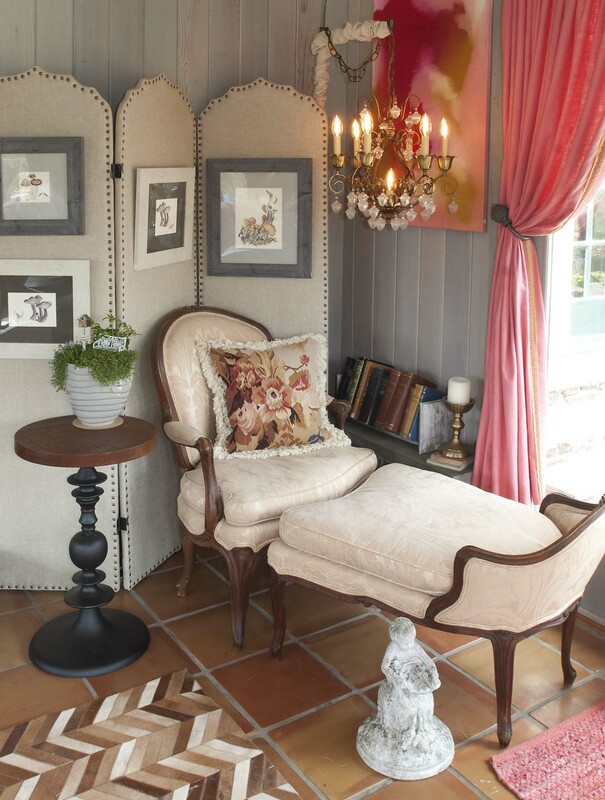 I also love the modern lamp and the Victorian style cloche on the desk. A pair of vintage rattan chairs were re-worked to provide a comfortable perch in the main seating area. The Ikat pillows were an important part of my color-scheme inspiration. I used this great metal display ladder in the center of the room to display accessories and plants (mainly succulents). A garden stool provides a convenient space for drinks. Here you’ll notice the magnificent Victorian mirror, which anchors the sitting area in the corner. The tufted coral linen settee is a comfy place to relax with its fluffy pillows. The coffee table is a re-purposed Victorian piano bench (the perfect size for this spot) and a pair of small custom slipcovered ottomans are seen in the foreground . Another view of the main seating area, featuring the mirror and settee. I used plenty of great vintage, antique, and modern accessories, along with plants and natural materials throughout the room. Featured plants in the sunroom were ferns, ivy, and succulents. Here you can see a close-up of the hand-painted pillow I used on the settee. It mimics the view of the pond out the window. I’m happy to report that this year’s designer house was a great success. I’ve already begun work on several projects with new interior design clients as a direct result of my Sunroom with Vintage Vavoom. Don’t get me wrong…not everyone loved the space. There were those who didn’t appreciate my eclectic design as much as others, and for just as many mine was their favorite space in the whole house. But that’s the joy of a designer house–there’s something for everyone! I tried to push the envelope a little bit with a bold and unusual color combination, paired with a funky mix of modern, retro, and true antiques. It’s definitely a space I, personally, would be happy to live in–a curated mix of all the things I love. Anyway, I hope you enjoyed sharing the journey with me! It was fun to share my process with you. Until next time, please tell everyone you know about Kristine Robinson’s blog–I need all the friends I can get! And please take the time to comment and tell me you’re out there. I love to hear from you! This entry was posted in Bucks County, Designer House, Home Decor, Interior Design & Decorating, Window Treatments and tagged accessories, Antiques, Bucks County Designer House, Color, Draperies, Duchesse Brisee, Furniture, Interiors, Mirror, Robinson interiors, Sunroom. Bookmark the permalink. Absolutely STUNNING Kristine!!! Well done! I am in looove with that giant mirror! How did you even get that in the room? Thanks so much, Terry! 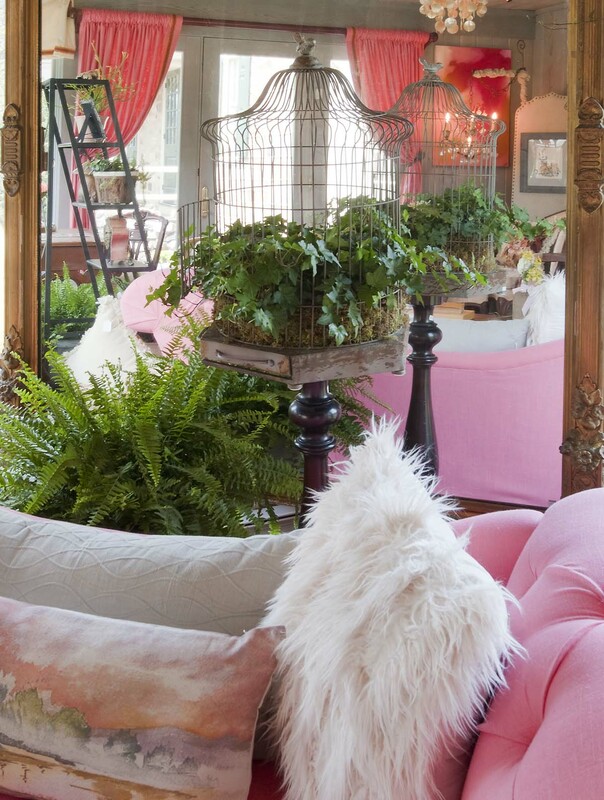 I LOVE the mirror too…I had it professionally delivered and we anchored it to the corner with hook&eye and chain…it rested on the ledge that ran around the perimeter of the space. 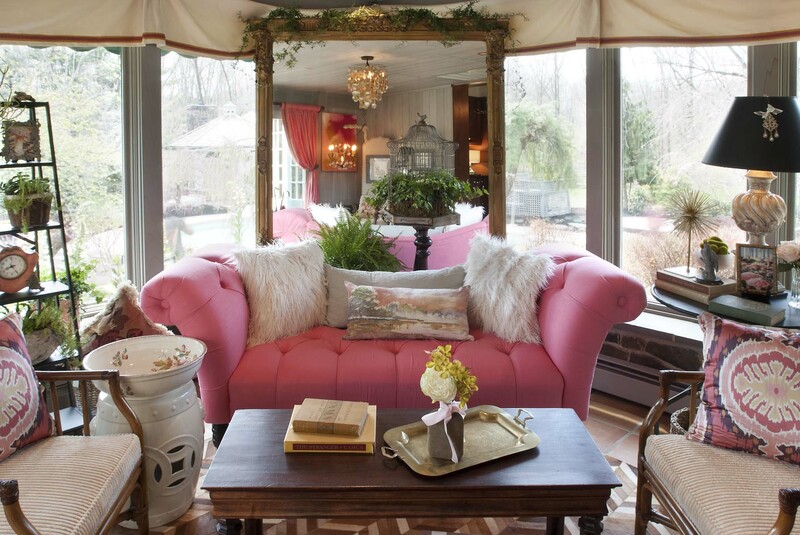 Plus the mirror provided a solid backdrop that I felt the room needed visually, to anchor the seating area. You’re so nice to comment. Thanks again!